Glycosylated haemoglobin (HbA1c) is a routinely used marker for long-term glycaemic control. This study aimed to reveal the correlation of HbA1c with BMI and HDL-cholesterol in Type 2 diabetic Saudi patients. This is an observational hospital based-case control study that was conducted in Najran University Hospital (Najran, Saudi Arabia). Patient’s sera were used to measure the concentration of HbA1c and lipid profile. Significant differences between groups were assessed by one-way ANOVA and t-test. Pearson correlation was done and the r values were calculated at level of (p<0.05) significance. HDL-cholesterol was significantly lower in diabetic patients than in healthy non-diabetic control group. Pearson correlation coefficient of HbA1c in diabetic patients with BMI was statistically significant (in spite of being weak) at the 0.0001 level. Moreover, there was a statistically significant positive correlation between HbA1c and LDL-cholesterol (r=0.271, p<0.0001), between BMI and LDL-cholesterol (r=0.240, p<0.0001), and between BMI and TG (r=0.196, p<0.01). It was concluded that HbA1c can be used as a helpful prospective biomarker that sustains the ability of prognosticating serum lipid profile in diabetic patients. The strong negative correlation between BMI and HDL-cholesterol in diabetic patients and the statistically significant positive correlation between BMI and LDL-cholesterol and between BMI and TAG make BMI to be an imposing predictor of dyslipidaemia in type 2 diabetic patients. HbA1c, HDL-cholesterol, LDL-cholesterol, Body mass index, Triacylglycerol. Diabetes mellitus is a group of metabolic diseases characterized by hyperglycemia resulting from defects in insulin secretion, insulin action, or both. The chronic hyperglycemia of diabetes is associated with long-term damage, dysfunction, and failure of various organs, especially the eyes, kidneys, nerves, heart, and blood vessels. 50% of people with diabetes die of cardiovascular disease (primarily heart disease and stroke) . About 382 million people suffered from diabetes in 2013 and this number is expected to rise to 592 million by 2035, while 175 million people remain undiagnosed. Ninety per cent of these people suffer from type 2 Diabetes Mellitus (DM) . Many longitudinal studies in adults have demonstrated that insulin resistance (IR) is a risk factor of the development of type 2 diabetes . The interest for IR and metabolic syndrome lies in their high prevalence in the population and the associated high death rate, fundamentally through coronary heart disease, even in nondiabetic subjects [4,5]. Glycated haemoglobin (HbA1c) is a routinely used marker for long-term glycaemic control. In accordance with its function as an indicator for the mean blood glucose level, HbA1c predicts the risk for the development of diabetic complications in diabetic patients1 and may be suggested as diagnostic criteria that detects more diabetes and pre-diabetes cases than fasting glucose or oral glucose tolerance test OGTT . An early intervention to normalize circulating lipids has been shown to reduce cardiovascular complications and mortality . The glycated haemoglobin (HbA1c) provides an index of type 2 diabetics’ average blood glucose level during the past 2–3 months and considered to be the most objective and reliable measure of long-term metabolic control of glucose . This study aimed to reveal the correlation of HbA1c with BMI and HDL-cholesterol in Type 2 diabetic Saudi patients. This is an observational hospital based- case control study that was conducted in Najran University Hospital (Najran, Saudi Arabia). Two hundred-twenty diabetic patients (120 males and 100 females) and 76 healthy non-diabetic control subjects (42 males and 34 females) participated in this study and their ages ranged between 35 and 86 years. Patients were clinically diagnosed as diabetic according to WHO criteria . All patients were newly discovered as type 2 diabetes. Patients who received previous hypoglycemic medications and those with abnormal liver function, nephropathy, neuropathy or retinopathy were excluded from the study. Weight was measured using electronic digital scales. Height was measured using a wall-mounted stadiometer. BMI was subsequently calculated as weight (kg) per height (m2). Cases for the study were selected in accordance with the above mentioned inclusion and exclusion criteria. Data were collected using a pre-tested pro forma meeting the objectives of the study. Five ml of venous blood were collected (in fasting state), venous blood was drawn into plain vacutainers, and then centrifuged and serum was separated. The sera were used to measure the concentration of HbA1c and lipid profile using spectrophotometric methods. Fasting plasma glucose and 2h- BG (after 75 g glucose load) were estimated for all studied subjects. Results of this study were statistically analysed using statistical package for social science (SPSS) program. Significant differences between groups were assessed by oneway ANOVA and t-test. Pearson correlation was done and the r values were calculated at level of (p<0.05) significance. Our study included 220 type 2 diabetic patients admitted to Najran University hospital. Fasting plasma glucose (mmol/L) was 11.42 ± 4.76 (mean ± S.D.) while 2 h-BS was 14.22 ± 5.01. Results of the studied parameters are listed in Table 1. BMI: Body Mass Index; FBS: Fasting Blood Sugar; 2h-BS: 2 hours Blood Sugar (after 75g glucose load); HDL-C: High Density Lipoproteins Cholesterol; LDL-C: Low Density Lipoproteins Cholesterol; Non-HDL-C: Non-HDL Cholesterol; TAG: Triacylglycerol. *Significant difference as compared with control group (Significance at level p<0.05). **Highly significant (Significance at level p<0.01). Table 1: Descriptive results of the study. Our results revealed that HbA1c % was significantly higher in diabetic group than that of healthy control group (9.71 ± 2.39 vs.5.47 ± 0.70, p<0.01). Additionally, HDL-cholesterol (mmol/L) was significantly lower in diabetic patients than in healthy control group (1.14 ± 0.34 vs. 1.70 ± 0.94, p<0.05). Pearson correlation coefficient of HbA1c in diabetic patients with BMI was 0.240 (Figure 1) whereas, it was -0.286 with HDL-cholesterol. This indicates that correlation is statistically significant (2-tailed) at the 0.0001 level. Moreover, there was a statistically significant positive correlation between HbA1c and LDL-cholesterol (r=0.271, p<0.0001), between BMI and LDLcholesterol (r=0.240, p<0.0001), and between BMI and TG (r=0.196, p<0.01). Such statistically significant correlations (in spite of being weak) between HbA1c and BMI, between HbA1c and HDL-cholesterol, between HbA1c and LDLcholesterol, and between BMI and TG are not found in healthy control group (r=-0.057, p=0.627; r=-0.225, p=0.051; r=0.075, p=0.518; and r=0.125, p=0.282 respectively). 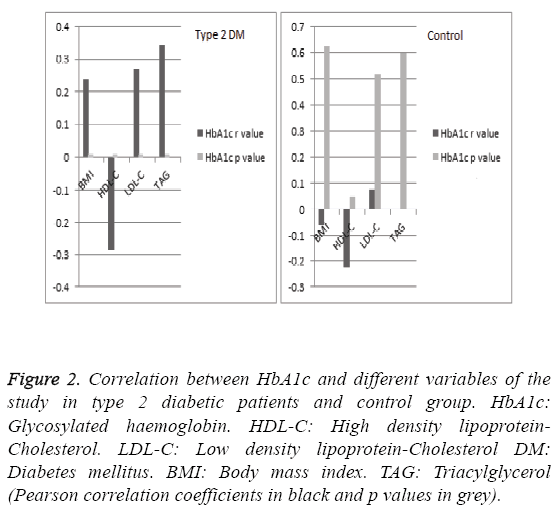 Correlations between HbA1c and different variables among diabetic patients and control group are explained in Figure 2. 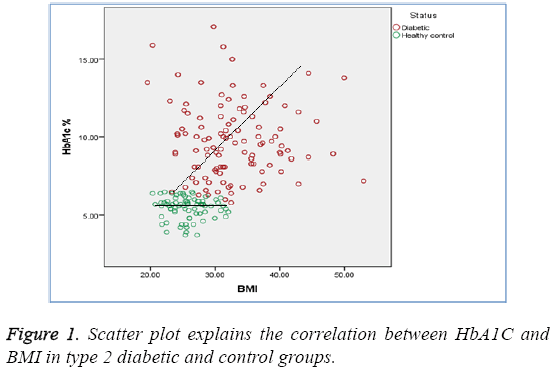 Figure 1: Scatter plot explains the correlation between HbA1C and BMI in type 2 diabetic and control groups. Figure 2: Correlation between HbA1c and different variables of the study in type 2 diabetic patients and control group. HbA1c: Glycosylated haemoglobin. HDL-C: High density lipoprotein- Cholesterol. LDL-C: Low density lipoprotein-Cholesterol DM: Diabetes mellitus. BMI: Body mass index. TAG: Triacylglycerol (Pearson correlation coefficients in black and p values in grey). From our study, it is clear that there is a statistically significant positive correlation between HbA1c and BMI (r=0.240, p<0.0001) and there is a statistically significant negative correlation between HbA1c and HDL-cholesterol (r=-0.286, p<0.0001) in diabetic patients. Moreover, there was a statistically significant positive correlation between HbA1c and LDL-cholesterol (r=0.271, p<0.0001). Thus, HbA1c can be used as a helpful potential biomarker that tolerates the ability of predicting serum lipid profile in diabetic patients and hence defining who are at a greater risk of cardiovascular complications. These findings are in concordance with many previous studies. Alam et al. reported that HbA1c can be used as a potential dual marker of glycaemic control and dyslipidaemia in type 2 diabetes mellitus . In another study carried out on the Western Indian population, Sheth et al. showed that the dyslipidaemic obese subjects had significant linear association with HbA1c in T2DM subjects . Consequently, early diagnosis of dyslipidaemia can be used as a preventive measure for the development of cardiovascular disease (CVD) in type 2 diabetics. Bodhe et al. concluded that HbA1c can provide valuable supplementary information about the extent of circulating lipids besides its primary role in monitoring long-term glycaemic control . Obesity plays a central role in the pathophysiology of both type 2 diabetes and its macro vascular complications. Moreover, Epidemiologic research of cardiovascular risk factors among patients with T2D and different BMI ranges may provide clues as to the relative contribution of obesity to the cardiovascular risk of patients who already have a higher risk of cardiovascular complications because of type 2 diabetes . Statistically significant positive correlation between BMI and LDL-cholesterol (r=0.271, p<0.0001); and between BMI and TG (r=0.196, p<0.01) makes BMI to be an impressive predictor of dyslipidaemia in type 2 diabetic patients. These results are concordant with some previous study which revealed that having obesity, BMI>25, was 3.6 times more associated with having non-high-density lipoprotein>130 mg/dl . Hassan et al. (2015)  reported a positive correlation between LDL-cholesterol and BMI and waist circumference (WC) in Egyptian diabetic patients. Naveen et al. (2014) found a strong positive correlation between insulin resistance (The homeostasis model assessment of insulin resistance or HOMA-IR score) and HbA1c (r=0.338, p=0.0001); and PPBG (r=0.348, p=0.0001). Moreover, a significant association was observed between HOMA IR score, HbA1c and BMI (p value of 0.024** and 0.000** respectively) . Raja Reddy et al. (2013)  suggested that HbA1c endures the ability of predicting serum lipid profile in both male and female diabetic patients. Thus, monitoring of glycaemic control using HbA1c along with lipid profile could have additional benefits of identifying diabetic patients who are at a greater risk of cardiovascular complications and their study suggested that relative risk of cardiovascular disease is higher in diabetic women compared to diabetic men, but the mechanism behind the increased risk need to be studied further. Significant low plasma HDL-cholesterol and high non-HDLcholesterol in diabetic patients compared with non-diabetic control group was found in our study. The low plasma HDLcholesterol levels have been attributed to increased fractional clearance of HDL secondary to depletion of its cholesterol. Many key enzymes involved in HDL metabolism are altered in obese people with insulin resistance. Some of these changes are further developed in type 2 diabetes where in addition to insulin resistance, relative or absolute insulin deficiency [17,18]. Thus, our study supported the idea of previous studies proposed the concept of ‘the lower the better’ which was confirmed for non-HDL: HDL but not for LDL that non-HDLcholesterol may serve as an adequate screening tool for dyslipidaemia in adolescents with diabetes [19,20]. HbA1c can be used as a helpful prospective biomarker that sustains the ability of prognosticating serum lipid profile in diabetic patients and hence defining who are at a greater risk of cardiovascular complications. Significant low plasma HDLcholesterol in diabetic patients compared with non-diabetic control group was found in our study. Findings regarding the statistically significant negative correlation found between BMI and HDL-cholesterol in diabetic patients and the statistically significant positive correlation between BMI and LDL-cholesterol and between BMI and TAG make BMI to be an imposing predictor of dyslipidaemia in type 2 diabetic patients. This work was supported by a grant from the Deanship of Scientific Research, Najran University, and KSA (NU/MID/14/042). VinodMahato R, Gyawali P, Raut PP, Regmi P, Singh KP, Pandeya DR, Gyawali P. Association between glycaemic control and serum lipid profile in type 2 diabetic patients: Glycated haemoglobin as a dual biomarker. Biomedical Research. 2011; 22: 375-380. Merakou K, Knithaki A, Karageorgos G, Theodoridis D, Barbouni A. Group-based education for people with type 2 diabetes mellitus in Greece: An observational study. Jrnal of NurEdu and Pract. 2015; 5: 118-125. Bunt JC, Krakoff J, Ortega E. Acute insulin response is an independent predictor of type 2 diabetes mellitus in individuals with both normal fasting and 2-h plasma glucose concentrations. Diabetes Metabolism Research and Reviews. 2007; 23: 304-310. Ford ES, Giles WH, Dietz WH. Prevalence of metabolic syndrome among US adults. JAMA. 2002; 287: 356–359. Naveen L,Santoshi M, Madhav D, SriRama AG, Mahesh V. A study of association of insulin resistance and cardio metabolic risk factors in an adult population with type 2 diabetes mellitus. InterJrnal. Appl. Medi. Sci. 2014; 4: 168-172. WooYC, Cheung BMY, Yeung CY. Cardio metabolic risk profile of participants with prediabetes diagnosed by HbA1c criteria in an urban Hong Kong Chinese population over 40 years of age. Diabet. Med. 2015; 32: 1207–1211. Windler E. What is the consequence of an abnormal lipid profile in patients with type 2 diabetes or the metabolic syndrome? Atheroscler. 2005; 6: 11-14. Singh G, Kumar A. Relationship among hba1c and Lipid Profile in Punajbi Type 2 Diabetic population. Jrnal Exe SciPhysio. 2011; 7: 99-102. Wrobel K, GaraySevilla ME, Malacara JM, Fajardo ME. Effect of chromium on glucose tolerance, serum cholesterol and triglyceride levels in occupational exposure to trivalent speciers in type 2 diabetic patients and in control subjects.Trace Elements and Electrolytes. 1999; 16: 199–205. Alam R, Verma MK, Verma P. GlycatedHaemoglobin as a Dual Biomarker in Type 2 Diabetes Mellitus Predicting Glycaemic Control and Dyslipidaemia Risk. InterJrnalSci Res. 2015; 1: 62-65. Sheth J, Shah A, Sheth F, Trivedi S, Nabar N, Shah N, Thakor P, Vaidya R. The association of dyslipidaemia and obesity with glycatedhaemoglobin. Clinical Diabetes and Endocrinology. 2015; 1:6. Bodhe C, Jankar D, Bhutada T, Patwardhan M, PatwardhanV. HbA1c: Predictor of Dyslipidaemia and Atherogenicity in Diabetes Mellitus. InterJour Bas MediSci Pharm. 2012; 2: 25-27. Vazquez LA, Rodríguez A, Salvador J. Relationships between obesity, glycaemic control, and cardiovascular risk factors: a pooled analysis of cross-sectional data from Spanish patients with type 2 diabetes in the preinsulin stage. BMC Cardiovascular Disorders. 2014; 14:153. Ram N, Ahmed B, Hashmi F, Jabbar A. Importance of measuring Non-HDL cholesterol in type 2 diabetes patients. J Pak Med Assoc. 2014; 64:124-128. Hassan MM, Sharaf SA, Soliman HM, Al-Wakeel NA. Dyslipidemia: A Cardiovascular Risk Factor in Type 1 Diabetes and Its Correlations. J Diabetes Metab. 2015; 6: 586. Raja Reddy R, Jayarama N, Shashidhar KN. Association among HbA1c and lipid profile in Kolar type2 diabetic population. Journal of Pharmaceutical and Scientific Innovation. 2013; 2: 10–12. Borggreve SE, De Vries R, Dullaart RP. Alterations in high-density lipoprotein metabolism and reverse cholesterol transport in insulin resistance and type2 diabetes mellitus: role of lipolytic enzymes, lecithin: cholesterol acyltransferase and lipid transfer proteins. Eur J Clin Invest. 2003; 33:1051-1069. Aljabri KS, Bokhari SA, Akl A. The Relation between Overweight, Obesity and Plasma Lipids in Saudi Adults with Type 2 Diabetes. Int J Diabetes Clin Res. 2015; 2:33. Kuryan RE, Jacobson MS, Frank GR. Non-HDL-cholesterol in an adolescent diabetes population. Jour CliniLipidol. 2014; 8: 194–198. Eliasson B, Gudbjornsdottir S, Zethelius B, Eeg-Olofsson K and Cederholm J (2014). LDL-cholesterol versus non-HDL-to-HDLcholesterol ratio and risk for coronary heart disease in type 2 diabetes. Euro JournPrevenCardiol. 2014; 21: 1420–1428.